Are you planning a jolly holiday in London? Our time in the City was just shy of three years. Not insignificant, to be sure. But not qualifying us as experts, either. That being said, the following is a compilation of the many emails I have sent over the years, in answer to the blog’s most frequently requested information: What should we do while visiting LONDON? SHOWS. Les Mis, Wicked, Lion King, etc. I happen to enjoy the theatre and would suggest a show to anyone visiting London – even with children. The government subsidizes show tickets, making it easier to finance a family night at the theatre. If you and your own have already seen all the popular shows, though, you may be more interested in planning a visit to Shakespeare’s Globe instead. The original building is located on the Thames, and hosts Shakespeare’s plays every night of the week. PALACES. The Tower of London is considered a palace, and is a brilliant day out – full of history (and the crown jewels)! 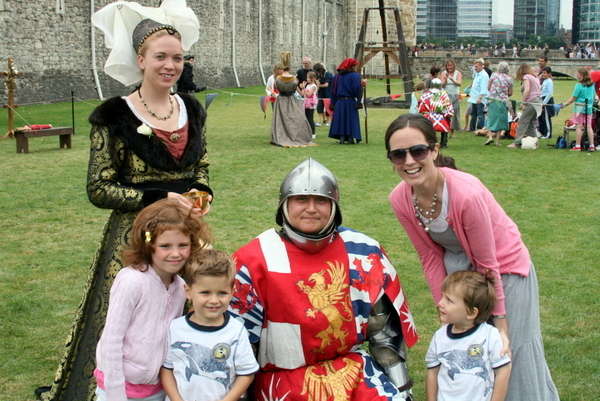 A tour of the Tower is free, once in the Tower gates, and given by the resident Yeoman. You can visit Kensington Palace, home of both Queen Victoria and Princess Diana. Kensington is located in Hyde Park. 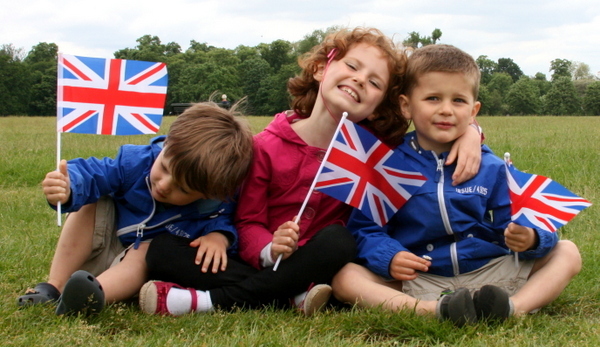 While there, be sure to take the children to the Princess Diana Memorial Playground – one of the best playgrounds in all of England. And enjoy afternoon tea at the Orangery. So British. There is Buckingham Palace, of course. You can buy tickets to go inside the palace, if the Queen is not on the premises. Or you may be content with a walk-by during the Changing of the Guards, held at 11:30am every morning. MARKETS. Do you like markets? My two favourite are Portobello Road Market (sung by Angela Lansbury in Bedknobs and Broomsticks) Saturday mornings, and Borough Market, every Thursday, Friday, and Saturday. Each, the bee’s knees! MUSEUMS. There are many many museums in London. And most are free, with daily activities for children. Our picks? The British Museum is a favourite, where you can find the Rosetta Stone and some other incredible treasures. The National Maritime Museum we frequented because of its proximity to our flat. And the Royal Observatory (where time started…literally) is directly up the hill from the Maritime Museum, through Greenwich Park. The London Transportation Museum is charming. Stop by Ben’s Cookies in Covent Garden, on your way home. Mmmmm. The Museum of London was absolutely fascinating. CHURCHES. 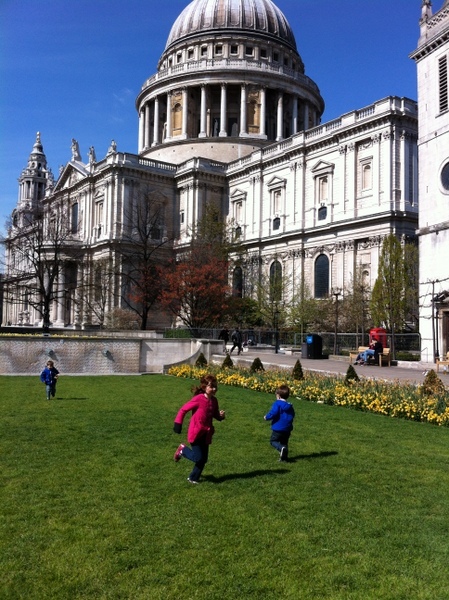 St Paul’s Cathedral is beautiful! Its dome, an iconic feature, can be climbed, from the inside. Or you can spend your time in the crypt, where you will find Nelson’s tomb. Outside, you can “feed the birds, tuppence a bag” (tuppence, tuppence, tuppence a bag…) It is the most beautiful church in London, in my opinion. And, if you don’t dine in the cathedral itself, down the street from St Paul’s is a brilliant place for dinner: Ye Olde Cheshire Cheese on Fleet Street – 17th Century Pub. Seriously good food. Seriously archaic pub. Westminster Abbey is thick with history (and a bunch of famous dead people). Monarchs, and Prime Ministers, Charles Dickens, William Wilberforce, Charles Darwin, Rudyard Kipling, CS Lewis, Jane Austen, and over a hundred more, share this Gothic monastery. FYI: According to St Paul’s Cathedral, Diana and Charles chose to marry there because they were on a “mission to become the people’s prince and princess.” Translation? They needed seating for a spectacle – St. Paul’s can hold 3,500. But William and Kate consistently said they wanted a scaled-back wedding and decided to become the 16th royal couple to marry at Westminster Abbey — capacity 2,000. TOURS. A site-seeing bus of London would introduce you to Trafalgar Square, Parliament, Big Ben, Tower Bridge, etc. Or you could take a short walking tour. There are many to choose from. And usually at a good price. FOR A GOOD VIEW. Try climbing to the top of St Paul’s Cathedral. Or take an elevator up to The Shard‘s viewing gallery. To see Big Ben, Parliament, Whitehall, and all the way east to Canary Wharf, ride the London Eye – the fourth highest construction in London. Or you can climb the 300 steps of Monument for another beautiful view. And, once descended, you will receive a receipt, certifying that you climbed all 300 steps! The children loved that! A FUN DAY OUT. 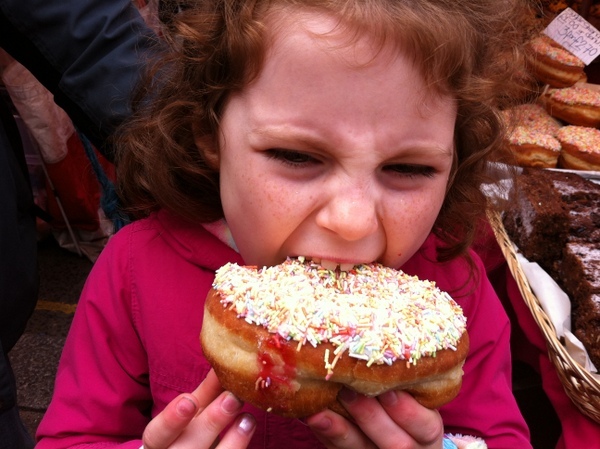 Ooooo….a really fun day out would be a visit to Borough Market in the morning for some incredible food, a walk past London Bridge and over Tower Bridge to the Tower of London. 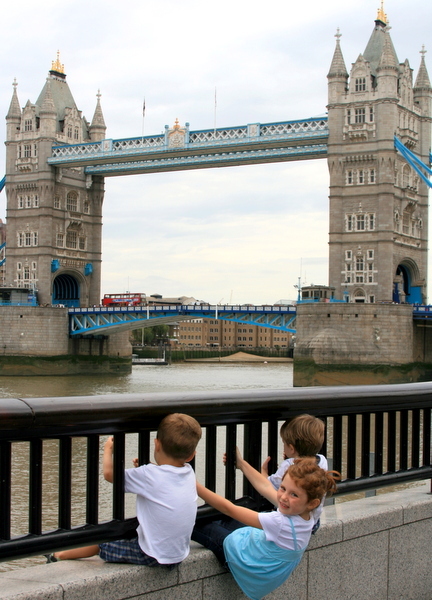 After a day at the Tower of London, you could walk a little north to Monument and take in a view on the city before dinner, followed by a show in London’s Theatre District. ANOTHER REALLY FUN DAY OUT. After viewing the city from The London Eye, walk over to Buckingham Palace for the Changing of the Guard, then walk past and take pictures of Big Ben and Parliament. 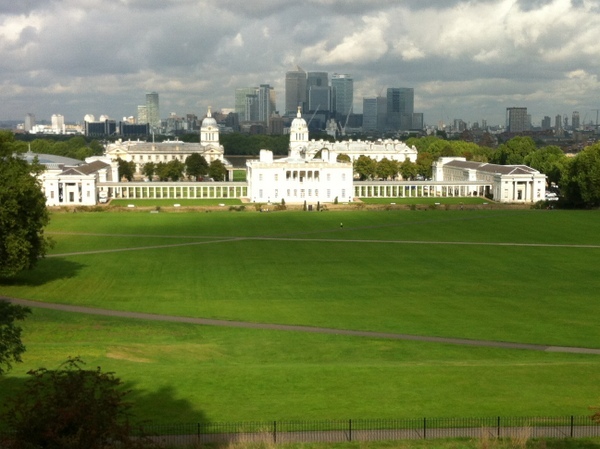 Take a river taxi up the Thames, alighting at Greenwich for the Maritime Museum/Cutty Sark Museum/tea at the Fan Museum. Maybe stop at the Observatory. In doing so, you would be taking your family across the earth’s hemisphere. FOR THE MONEY-WISE. The London cabs are charming, but expensive – much more expensive than a yellow cab in Manhattan. Be warned. Older children can get a discounted price on an Oyster card, but they will need to apply for it in advance, and with a picture ID. There are boat tours down the Thames, but we preferred a ride on The Clipper. It is public transportation, at a public-transportation-price-tag. And thereon you can see everything you could’ve seen on an expensive tour, just without the commentary. 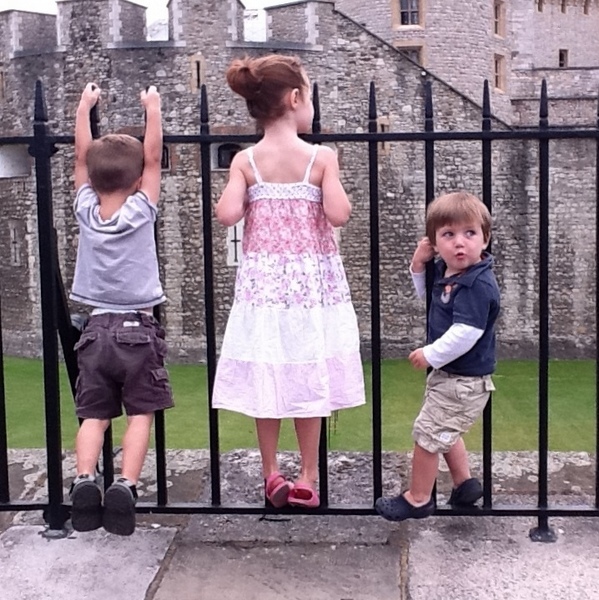 Purchasing a year membership to Historic Royal Palaces – Tower of London, Kensington Palace, Kew Palace, Hampton Court, and the Banquet House – may be well worth it to you and your family, even if you are only in London for a short time. Tickets for a family to go to any one of these palaces add up quickly. WHAT ELSE. Ride the double-decker buses! Any chance you get, go to the top, front. Find a chippie for some proper fish ‘n’ chips. Wear good walking shoes; wellies in the rain. Plan to spend more money than planned. Learn some British terms, and try to use them. And please pronounce “quay” as “key”. Hi Rachel! I’ve been thinking of you & wondering when the big move was planned to happen. So happy and excited for you all. We need to catch up. Mikaela!! The move is happening in July, after our time in Iceland/France/England. Are you still up for foreign guests, for a night? Everything is going forward!